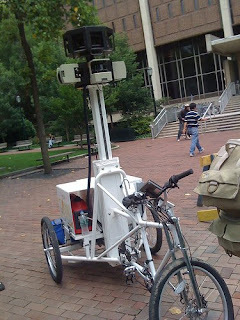 Last week the Google Street View Bike was spotted on Locust Walk snapping pictures in front of the Button. The cameras take shots and geo-tags the photos so users can get a street-level view of where they are on Google Maps. 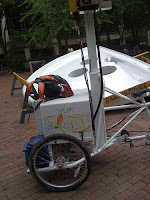 The bikes were created so they could photograph smaller areas that the car can't access (like campus walkways). No word yet on when these images will come to Google maps. Thanks to Scott Spitzer (Penn Staff) for the photos! Check out all his work at http://www.scottspitzer.com.